Calendar - I'm The Chef Too! Travel back in time and learn about our history all while whipping up some tasty recipes! Become paleontologists by creating fossilized dinosaur eggs, blast off into outer space and learn about our solar system with rocket cookies, or even step into the shoes of a geologist and learn about how rocks and crystals are formed with our cupcake geodes. Chefs will explore a variety of new recipes, ingredients, and culinary skills through hands-on, highly engaging activities. Each recipe is an adventure that is sure to keep you on your feet! Come join I’m the Chef Too! for our Fall Mommy & Me series for children ages 2-5. Each session we’ll learn about something from fall and participate in a cooking/food activity. Classes are held: Oct. 16, Oct 23, Oct 30, and Nov 6. We know that life happens when you’re making plans, so when you register, you are buying a specific number of sessions that you can use when you want. You aren’t locked in to a specific date/class. While unused sessions are not refundable, they are transferable– you can give them to a friend– just let us know! If you start with attending one, you can always buy more sessions. There is a discount for buying 3 & 4 sessions at a time. And due to the flexible nature, others can join at any time throughout the 4 sessions. To help us with planning, after you register, please sign up on the Google Doc to let us know the dates you are planning to attend. If something changes, simply erase and select a different class. Looking for a place to enjoy holiday treat decorating outside of your house? Come join I’m the Chef Too! MD for a festive family afternoon featuring gingerbread house/cookie decorating along with additional holiday-themed activities! You can bring your own baked goods to decorate or purchase them from us (please include this at the end of your registration). There will be complimentary hot chocolate and cookies for all of our chefs. We can’t wait to celebrate the holiday season with you! the wizarding world of culinary concoctions! 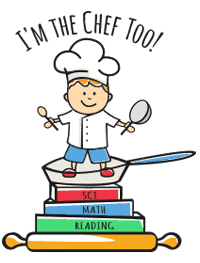 Come explore a variety of educational concepts all while whipping up some tasty recipes! Become paleontologists by creating fossilized dinosaur eggs, blast off into outer space and learn about our solar system with rocket cookies, or even step into the shoes of a geologist and learn about how rocks and crystals are formed with our cupcake geodes. Chefs will learn new culinary skills through our hands-on, highly engaging activities. Each recipe is an adventure that is sure to keep you on your feet!